By using our point of sale system as a front end, your merchandise operation unlocks a variety of reporting, inventory control, forecasting and ordering features. Our staff will come on site to manage the point of sale area, train your volunteer cashiers, interface with merchandise staff and vendors and provide detailed reporting services. While we do not provide cashiers or coordinate volunteers, optional use of our volunteer management module can assist with uniform distribution and scheduling. Our corporate merchandising system allows you to process customer requests and fulfill orders with merchandise vendors. A variety of sophisticated tools allows one person to manage tens of millions of dollars in corporate orders for multiple, simultaneous events. It has been, and is, used to manage dozens of events world wide. The sister module to the inventory and purchasing system is our sophisticated forecasting system which uses event data to make detailed predictions about future sales and when to reorder product. Using historical data and emerging trends from the event in progress, we'll help you make the most of your potential audience. 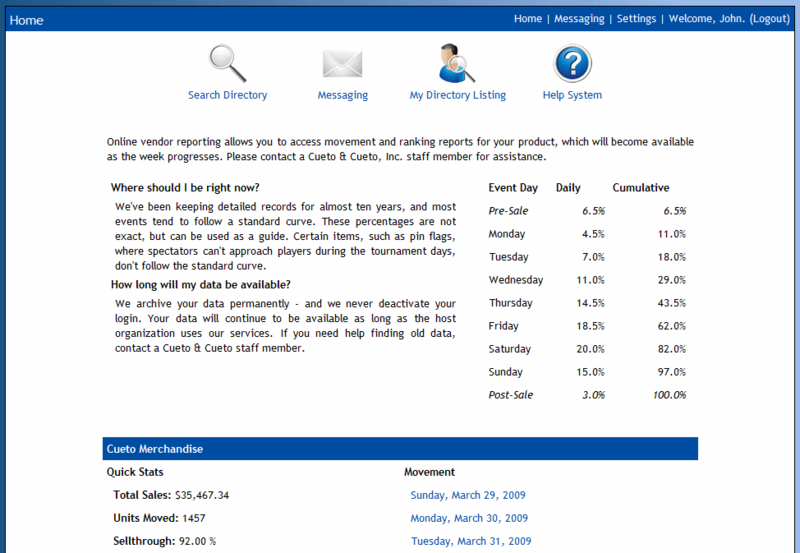 Our inventory and purchasing system is in control before and after sales are processed. When preparing for an event the system handles placing orders, receiving product and printing barcodes. During an event, it provides real time monitoring of inventory as it passes through the point of sale system and manages reorders. Dozens of reports, including detailed vendor movement and sellthrough analyses, help you understand trends as they occur. While the tent is open our staff will be positioned in the point of sale area to answer questions for cashiers, assist chairpersons with shift changes, handle special sales and keep the register area tidy, including checking on bags, bubble wrap, hangers, returned product and receipt tape. We offer a variety of reporting options for merchandise vendors, including a vendor services computer which prints sales reports and labels and a vendor portal, with personalized logins, on each event's instance of the website. Vendors are able to log in at the event or remotely and get movement reports and basic sales figures such as sellthrough for the entire week. The information is archived permanently and vendor logins are never deactivated. Additionally, we'll coordinate meetings between vendors and tournament staff to discuss forecasting, reordering and restocking. 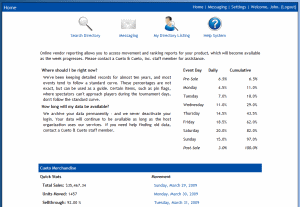 A merchandise vendor's personalized homepage provides historical trending, quick statistics and detailed movement information for each company that a vendor represents.